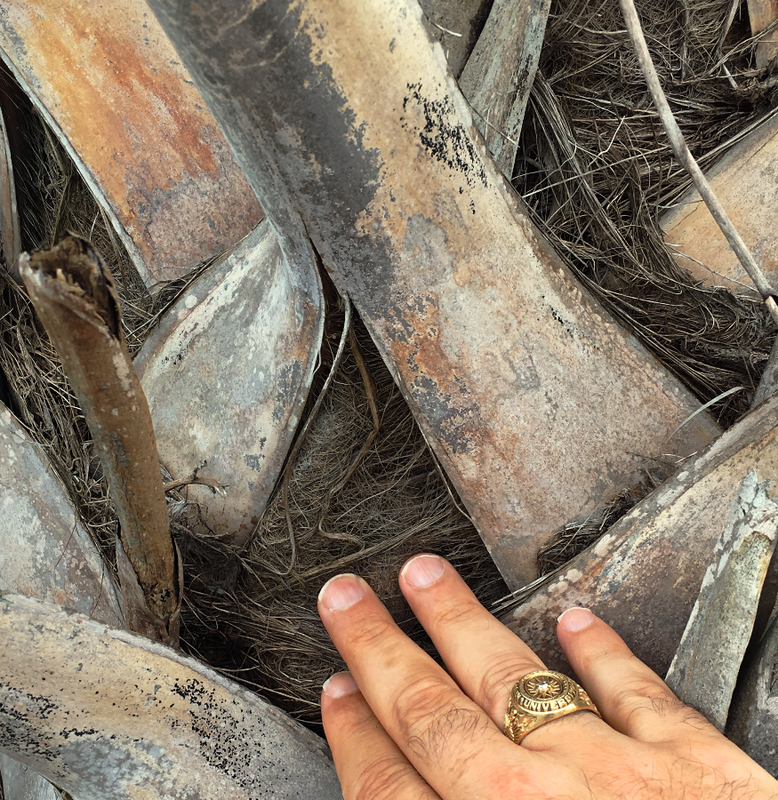 I touched a palmetto tree and her skin moved. I waited till the right moment and positioned my hand, trying to let her know I meant no harm. I placed my fingers on her thick hide. She was rough and soft—somehow that was possible—and her mammoth-like wool sat on her skin as nothing I’d ever known. I was stunned. And that lead me to a promise. I saw you, standing at the side of the road, big and tall and seemingly very old. I slowed my car and looked around—no one else was going to stop and spend any kind of time with you. The speeding passersby were all on their way to somewhere, who knows? Perhaps to the beach, or to the store to get batteries. But I was a lone traveler, a stranger here, and you were also alone. I parked my car and approached you. Were you okay for some company on this hot morning? Did you have anyone to be with? Because I did not. Was there anyone checking up on your regard? Because in this world—after the funerals and settling the estate and playing family peacekeeper—I had no one. You didn’t seem to mind my company at all. I looked at your trunk. It was made up of dozens of odd stems that seemed dried and dead. The two-inch flat ends were cut close to what I regarded as your “skin” and formed a distinctive cross-hatch that I suppose made it easier for people to navigate around you. Those cuts looked painful, but you did not seem in pain. Silence, consent. Lack of motion. Agreement. I reached my hand out. And of all the things in this world, I’ll never forget how you felt, or how you made me feel. It started with my eyes. All the emotion and dread that had been welling just behind them found a sympathetic soul at your sight. Yes, yes! The frond cuts had been painful to you. Yes, you’d experienced an awful period of cutting. Why hadn’t those men followed procedure? Why hadn’t they cleaned and sharpened the blades? Men with rusty, serrated knives had hacked you with no care or love in their work. I heard all that, very clearly true. I understood. And then you had more. Your companions, those trees raised right next to you, were removed to make way for the street and sidewalk, the way to the almighty beach. Healthy, ripped out. Mutilated. Dead. I took it. I got you, with the understanding that the men who’d done that damage were long gone. And it was me who was standing close now. People all over the world travel, and meet, and make acquaintance-level friendships. I wondered how far two parties would go if they were tasked to make an impact on the true welfare of the person opposite them. I’m not talking about if it was their job to do so. And not by flowing money. Nor by making phone calls to implore others to pick up the job. I think for the benefit to work, the movement had to come from the minds of the two individuals. How far would each go to provide gain for the other? Because here we were, queued up in just that way. As I reached out, the impression that I was feeling transferred from my face to my fingertips, just like that, directly from your flesh. Was that you, moving? Because I was shaking, and I couldn’t quite tell what was going on with you. Was it both of us who’d moved? You, in the way that was natural and undamaging. Me, in a way that sought to find the damage. The tactile sensation at my fingertips didn’t actually come into me. I didn’t absorb your feeling and pull it in. Instead, your odd softness, and the give from your skin, was processed by us in a way that traveled outward, away from me and you. How can something moving outward possibly provide a positive to us? How stupid was it to think I was worth any benefit at all. One household fire and my family was gone. Died in their sleep while I was stuck across the country in an airport hotel. Old smoke detector batteries; my fault. A change in life status and my friends were shorn—it seems there was no likeness or similarity for them to stay linked. And I felt so dead inside, I just didn’t care. All my friends died in that fire. My job burned there. My friends: If you were truly mine and if you had any regard for my welfare then I virtually picked you up and dumped you in the ash. Every single one of you, and every single thing that was important. Nothing I’d cared for was going to be left intact. My doctor called it something akin to a cascade, and then he too was in the ashes. And I hit the road. In a rental. Because my car was destroyed. Then—after how long?—I saw you, palmetto tree. You, being ignored by all others; you, looking so rough. You, peed on by dogs and hammered with yardsale signs. You, tropical-stormed. Sawed for cosmetic appeal and sidewalk practicality. You, who just happened to accept a query from a stranger in traffic. We touched, and connected. When I pulled my hand back, and when I drove away, we were still in contact—we will always be. You asked me something as I turned on to the interstate. Your words came into my mind and without hesitation, I made a promise to you. It was very natural. As I made my promise, the tears flowed again, so many, so much. I will never drop you in the ashes. No, no, no, my dear friend. Not any physical piece of you, not any memory or hint or trace of you. And from that moment forward, I never did. To anyone. Again. Ara Hagopian’s upcoming book THE WINNING KIND is available through pre-order only.